Sunflowers are extremely tolerant of drought and heat. They tend to thrive in almost any type of soil except a very heavy clay. 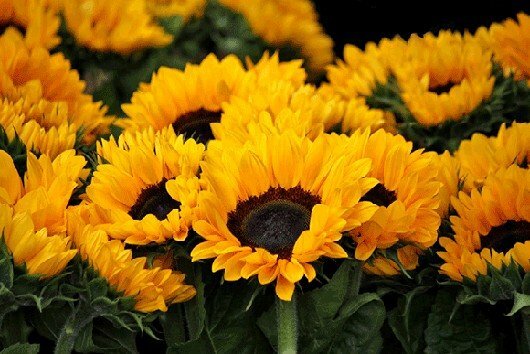 The big, friendly, sun seeking faces of sunflowers make them a cheerful part of the summer garden. They appeal to people and to wildlife and can bring interest, colour and drama to a sunny space. They are a good annual flower to grow with children and can even provide a yield in the form of seeds. Nasturtiums are pretty and colourful flowers that are easy to grow. This makes them another favourite with novice gardeners and children. As well as looking pretty, nasturtium flowers can also be eaten and can enliven a spring or summer salad with their brightness and peppery taste. As long as they get enough sunshine, Marigolds will grow just about anywhere. Not only do they look pretty, Marigolds are also something of a miracle worker in terms of companion planting. The scent of the flowers can repel animals and insects and what is more, under the ground, marigolds can repel nematodes and other pests from an area for up to three years. Pansies are an easy plant to grow and look lovely. They are not very fussy and will grow in most types of soil or growing medium without too much trouble. Pansies are delightfully easy to grow and create a cheerful, colourful display on containers or in garden beds. Varieties can be found that will bloom all throughout the year. If you chose your varieties carefully you could have pansies in bloom in your garden year round. You can even add them to your salads. Easy to grow and attractive, aquilegia come in a range of different colours and varieties. They also self-seed readily so plant them once and you can enjoy them year after year. They will tolerate almost any conditions in sun or semi-shade and are hardy, and hard to kill, even for those whose gardening skills leave something to be desired. The California poppy is a drought tolerant annual and can survive even in poor soil. It will tend to survive even if you have not been very good at keeping up with watering in your polytunnel garden. Scatter a few seeds where you want them and they will pretty much take care of themselves, self seeding to create a display for the following year. Sweet peas are easy to grow yourself from seed, though you can also buy plants easily from garden centres and plant nurseries. The only problem tends to be that mice will nibble young seedlings, so to avoid this problem, cover them with cloches (plastic bottles cut in half work perfectly). Borage is a great addition to a wildlife or culinary garden. It is an annual but can self-seed very readily. Its appealing blue flowers are attractive to humans and to bees and butterflies and the leaves and flowers can also be used in the kitchen. Annual flowers are not the only option for novice gardeners. Some of the easiest things to grow are perennial flowers that will return year after year. Comfrey offers great value for any gardener and will grow almost anywhere. In fact, it is difficult to get rid of once established, so make sure you are happy with where you place it. Comfrey has very deep roots which make it good at collecting nutrients from deep below the soil. You can use it to mulch, or to make a liquid feed to feed other plants in your garden. It is also great at attracting bees and other beneficial creatures to your garden. Which Flowers Should You Grow During Autumn?